Our new Stretchy, Shimmery Knit Polyester Fabric Bolt in this awesome shade reminds us of a beautiful sparkling blue sky! 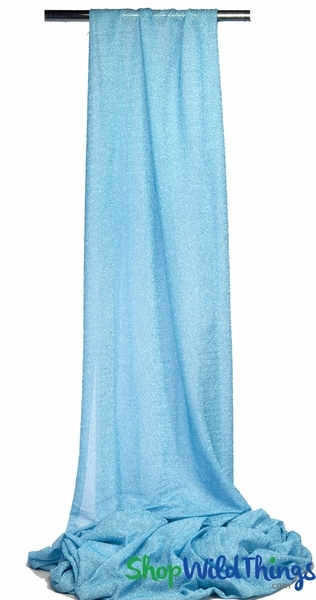 With thousands of tiny metallic light blue threads running through the fabric it shimmers and glistens! You�ll receive a 22" wide by 30 ft. long bolt of this impressive fabric that's a great alternative to tulle but also looks wonderful used in conjunction with tulle. The fabric is see-through and the edges are unfinished. The slight stretchiness of this fabric makes it easy to work with and it's ideal for wrapping, covering, ruching or tying into bows. 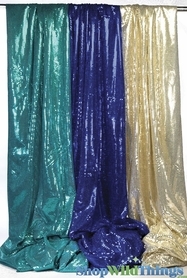 Drape around arches, columns, and banisters or use on tables or as chair sashes and bows. 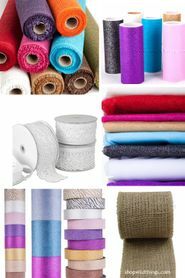 decorate and enhance vases, floral displays or wreaths and this is the perfect material for fabric crafts and hobbies, costumes or headgear! Check out all the brilliant colors on our new Knit Polyester Fabric Bolts!